Two years ago, I made the trek to Denver’s Marriott Tech Center Hotel to attend the 2016 edition of the Rocky Mountain Audio Fest (RMAF). It was an unusual event as the hotel was under construction and much of the show was held in tents and pods (see 2016 show report linked below). Now that the work on the hotel has been completed, I looked forward to a return to this year’s RMAF and the show lived up to expectations. Let’s dive right in and talk about some of the audio highlights at this year’s show. Three years ago, Acoustic Sounds purchased The Mastering Lab and began the process of moving the famed mastering facility to Salina, Kansas. 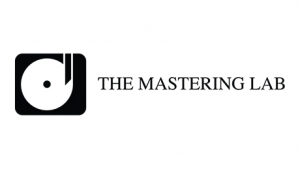 At a news conference held as the doors of RMAF opened, Chad Kassem from Acoustic Sounds announced that the transition from Ojai, California to Salina has been completed and The Mastering Lab is now open for business at Acoustic Sounds headquarters. Kassem noted that with the re-opening, Acoustic Sounds now has an end-to-end offering for customers who want to release their albums on LP or music download via recording at Blue Heaven Studios, mastering and cutting at The Mastering Lab, graphic design at Acoustic Sounds, label printing at Acoustic Sounds Printing, plating and pressing at Quality Record Pressings and direct-to-consumer sales at Acoustic Sounds. To celebrate this milestone, Kassem announced plans for a direct-to-disc album that would be simultaneously recorded direct to DSD (for music downloads release) with singer Shelby Lynne, best known for her tribute to Dusty Springfield—an Analog recording titled Just A Little Lovin’. He also mentioned a conversation with Dave Mason about a direct-to-disc and direct to DSD project as well. This is something to watch for in the year ahead! We also received an update from Acoustic Sounds on their Jimi Hendrix remasters project. To date, the Analogue Productions label at Acoustic Sounds has had a positive response to their release of three classic Jimi Hendrix albums (Machine Gun: The Fillmore East First Show, People, Hell & Angels, and Axis: Bold As Love) on LP and Hybrid Stereo SACD. Kassem told us that over 4000 LP copies of Axis: Bold As Love have been sold. The fourth Hendrix album heading for a new reissue—Are You Experienced?—is on track for release in 2019. 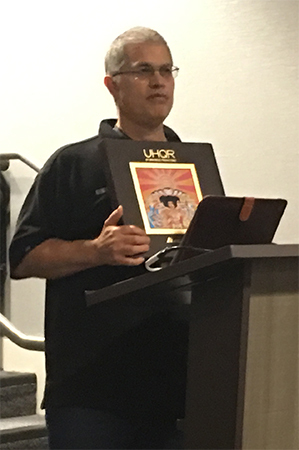 Starting off the show, I went to room 1030 where Rene Laflamme, Nagra’s Sales and Marketing Manager was unveiling the latest member of the company’s HD product line—the Nagra HD DAC X. 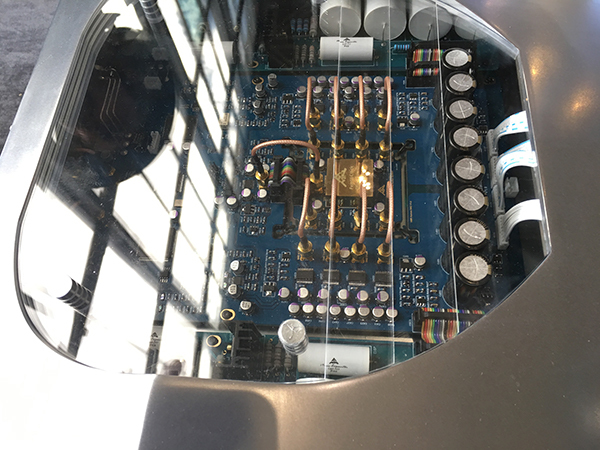 The HD DAC X is the top of the line successor to the Nagra HD DAC which offers stellar Stereo DSD 64, DSD 128 and PCM playback using Nagra’s fine analog designs with a digital engine designed by Andreas Koch of AK Designs. The new HD DAC X adds Stereo DSD 256 playback to the earlier HD DAC and a host of improvements including ultra-low noise power supplies, dual mono construction, improved damping and vibration control and a new digital core. 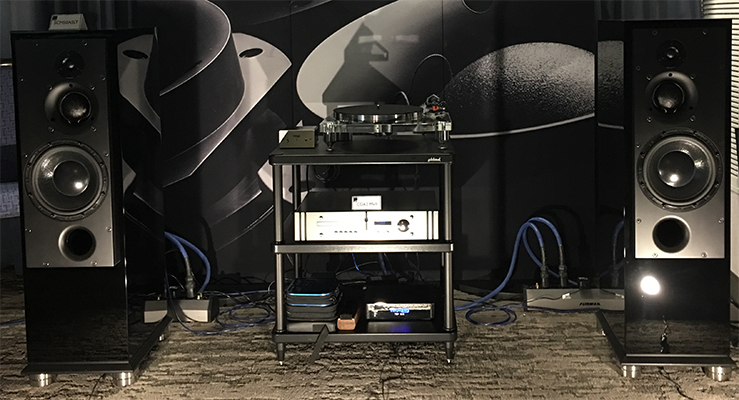 Rene gave listeners a taste of what the HD DAC X ($65,000) with the Nagra HD Preamp ($59,500), the Nagra HD Monoblock Amplifier ($86,000) and the Rockport Technologies Cygnus Loudspeakers ($62,500) can do using a pair of Stereo DSD 256 recordings: “St. Thomas”—a Sonny Rollins composition performed by the Yuko Mabuchi Trio on their excellent debut album from Yarlung and an Analog Master Tape to DSD 256 Stereo transfer of a Louis Armstrong track that was mastered by Rene and is available on the 2xHD label. Both tracks were reproduced with notable refinement and ease. The HD DAC X will be available later this year. Nagra is also planning a new model of the HD DAC that will come out in Spring 2019. Rene told me that owners of the original Nagra HD DAC would be able to upgrade their units to the level of the new HD DAC model. It is part of Nagra’s commitment to their owners of the lasting value of their products. Nicely done. Merging Technologies partnered with sound designer Michael Broughton from The Audiophile Source at RMAF to show the first of two new products in the Merging Technologies NADAC product line. Following up on the original Stereo and Multichannel NADAC (Networked Analog to Digital Audio Converter), the NADAC Player (NADAC with integrated Roon), and the Merging+Power (DC Power unit for the NADAC DACs) products comes the Merging+Clock. The Merging+Clock shares the same case as the earlier NADAC and Power products and can be connected to the NADAC and NADAC+Player products using the existing Word Clock input on these products. But it also includes added inputs so that the new product can be used with other high-end audio and pro audio products to provide Word Clock capabilities. The Merging+Clock is designed to be a “Grand Master” clock which, like all Merging products, is connected to an Ethernet Network or Switch. That will allow any DAC or Ethernet-enabled product on the network to use/share a Merging+Clock, even if they are some distance apart. There will be two versions of the Merging+Clock product—a Low Noise (LN) edition which will sell for $16,000 and an Ultra Low Noise (ULN) edition that will sell for $42,000. Merging says that “both use instrument-grade crystal oscillators to achieve stability better than an atomic clock. The LN (Low Noise) version achieves a frequency stability of +/-25ppb which is remarkable enough, but the ULN (Ultra Low Noise) version achieves an unbelievable +/-10ppb. At least we believe so, but this is outside measurable limits! 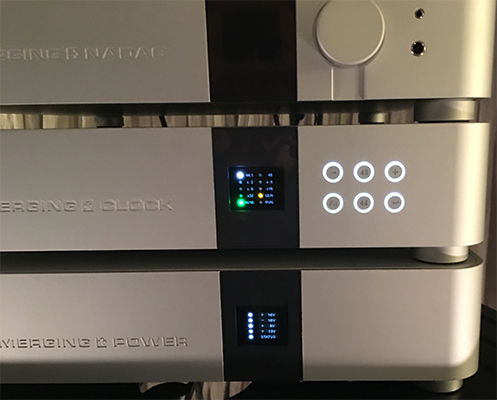 At RMAF a variety of DSD and PCM musical selections were played through a system that included the NADAC Player PL-8 ($13,500), Merging+Power ($6500) and the new Merging+Clock LN ($16,000). This included “Seriously” performed by the Yuko Mabuchi Trio on Yarlung in DSD 256 and a guitar instrumental by guitarist Dean Peer in 16-bit, 44.1 kHz PCM. In both cases there was an uncanny sense of added definition and depth to the music. The PCM guitar track seemed to benefit more from the new Merging+Clock than the DSD 256 track. Which some would expect since DSD is said to be less sensitive to clocking issues than PCM recordings. In any case, the Merging+Clock will warrant interest from both NADAC and other DAC owners in the home and pro market based on what was heard at RMAF this year. Keeping with their tradition of using a different system at each audio show, the Merging demo featured loudspeakers, cables and integrated stereo amp from a new company based in Canada with the unlikely name of Artist Cloner. This setup included the Scorpi Integrated Amp ($9999), Rebel Reference 2-way Loudspeakers with Stands ($11,999), Solitz Speaker Cables ($1073) and Pteros Power Distributor ($3669). All of which come with an 8-year product warranty. The Artist Cloner Rebel Reference 2-way speakers are relatively small and light (32 pounds) but they put out a surprising amount of low-end bass and deliver a very energetic sound. These speakers can really rock. Artist Cloner designer and CEO Sylvio Comtois tells me that the Rebel Reference is the first of three planned speaker models from the company. I’d say that this is a new player in the speaker market to watch. Like Merging Technologies, ATC (Acoustic Transducer Company) got its start in the pro audio market. The company was founded in the UK by speaker designer and musician Billy Woodman. 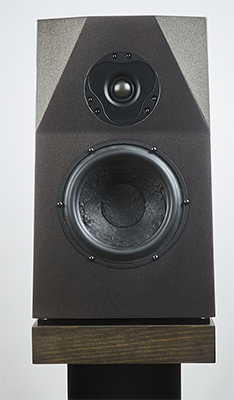 At ATC his first product was the ATC SCM50 loudspeaker with its now famous 3.5″ mid-dome driver. After becoming a great success with their studio monitor speakers in the pro audio market, ATC created speakers in more richly appointed cabinets for the home audio market. ATC is a strong believer in Active Speakers that feature built in amps (although they also offer passive editions of their speaker line). Something we rarely see in the high-end home audio market. They feel that the active speaker approach lets ATC have full control over the crossover, amplification and electronics of the speaker. Resulting in better imaging, phase accuracy and eliminating issues with impedance loads presented by speaker cabling. At RMAF, ATC demonstrated a new version of their CDA CD Preamp and DAC ($4249). The CDA2 Mk 2 CD Preamp now features Stereo DSD playback up to DSD 256. At the Rocky Mountain Audio Fest, the new CDA2 was connected to a pair of the Special Edition ATC SCM50SE powered speakers ($65,999/pair) and was playing music from CDs and music files via a Mac laptop running JRiver Media Center. Selections included music from a CD as well as music downloads from Shelby Lynne’s album Just A Little Lovin’ and finally an Analog to DSD 128 music download from the Native DSD Music store featuring 2xHD-Storyville Records with Jazz Saxophone Legend Ben Webster’s album Gentle Ben. The sound from this system was easily among the best heard at the 2018 RMAF show. Detailed, smooth, warm and very musical. Music that you could listen to for hours at a time. This setup is on my 2018 Writer’s Choice Award list—and for good reason. On the way to the RMAF show floor, I found myself in the hotel elevator with two audio industry veterans from UK’s high end audio company Abbingdon Music Research (AMR) and iFi Audio (AMR’s subsidiary that specializes in affordable, portable and mobile audio products): Thorsten Loesch (Chief Designer) and Vincent Luke (Marketing Manager). They were bringing down a large wood crate to the show and when I asked about what was inside Vincent said, “You will want to see this.” With an intro like that, my next stop was indeed the iFi Audio booth as Thorsten and Vincent maneuvered the wood crate through the crowds on the way to their exhibit. In talking with Thorsten and Vincent I was also told that the Diablo DAC from AMR was developed along with the new iFi Pro iDSD DAC that was recently released to the market. The Pro iDSD has some “trickle down” features from the statement DAC and the co-development of both products led to the Pro iDSD staying in development a bit longer than originally planned. In fact, iFi says that the Pro iDSD is a “scaled down” version of the Diablo DAC at a fraction of the price (the Pro iDSD sells for $2499). Given the extensive DAC experience on the AMR and iFi Audio team, I’m looking forward to giving the upcoming AMR Diablo DAC a full audition when it moves from prototype to finished product. It will be a very much anticipated product in the year ahead. Ray Kimber from Kimber Kable and IsoMike hosted a no holds barred demonstration of his 4-Channel DSD Surround Sound recordings. The setup included playback of IsoMike recordings using Merging Technologies Pyramix software and Analog to DSD 256 converters powered by massive monoblock amps from Ed Meitner’s EMM Labs and Focal Utopia III Evo speakers. Kimber played DSD 256 Surround Sound recordings of a Drum Corp at a university in Utah. To guarantee a totally quiet background, the local airport rerouted planes so they would not pass over the area and the university’s HVAC system was shut down during recording. Now that’s a commitment to a recording and it was very impressive. Next up was a Surround Sound recording of a motorcycle race track with the race announcer in the right surround speaker as the motorcycles whizzed around the room. Very dynamic and a lot of fun! 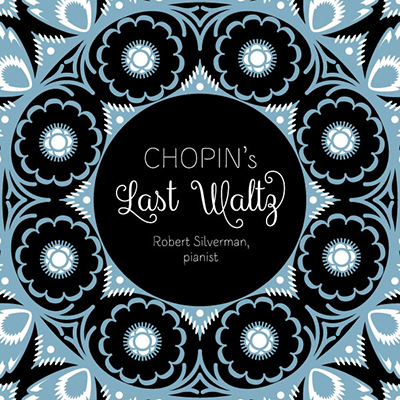 Moving to the world of classical music, we heard a track from Robert Silverman’s excellent album Chopin The Last Waltz. This is a live, direct to 4-Channel DSD 256 recording that was released on Vinyl LP through Acoustic Sounds and on DSD 256 Stereo and DSD 256 Surround Sound with Native DSD Music. Kimber explained that listeners may want to turn up the volume when playing this recording at home since no compression or processing was used. It is a straight Analog to DSD 256 recording. The result was some very realistic and compelling piano reproduction. Another treat at the IsoMike presentation was a sneak preview of Russian Masterpieces. This upcoming IsoMike release features a classical music duo in another wonderful live, direct to DSD Stereo and DSD Surround Sound recording. Kimber told the audience that the IsoMike team will be packing up the Merging Technologies equipment to bring this album to Kevin Gray’s Cohearent Sound for LP mastering in anticipation of release in 2019. I sense another winning release from the IsoMike team here! RMAF also shined the spotlight on Multichannel Music during the seminar program with a session titled “Multichannel Music: The Promise and the Problems.” This session was moderated by Andrew Quint, Senior Contributing Editor at The Absolute Sound and featured panelists Kal Rubinson, Senior Contributing Editor and Music In The Round columnist at Stereophile and Brian Moura, Associate Editor at Positive Feedback and Technical Advisor for Native DSD Music. The session covered a host of topics including why most Multichannel releases are in the Classical Music genre, the spatial advantages to Multichannel recordings, can an audio system play film and music Multichannel equally well, the pros and cons of using the center channel in 5 and 5.1 channel recording, and several more topics. The seminar also featured a lively audience participation segment. The seminar was videotaped, and you can dive in to the full details after the show on You Tube (check the link to the video below). When I think of the Rocky Mountain Audio Fest, one of the first things that comes to mind is the Marriott Tech Center Hotel in Denver. But that has come to an end with this year’s show. Starting next year, RMAF will be held at a new venue—the Gaylord Rockies Resort and Convention Center in Aurora, Colorado. The new show location is much closer to the Denver International Airport than the current hotel and is said to offer larger demo rooms and suites at the largest convention center in the state of Colorado. Early reaction to the news from exhibitors has been very positive. Another change is a move of the show dates up one month—to September 6-8, 2019. But the change is only for next year. In 2020 and 2021, RMAF will return to the month of October at the new Gaylord Resort & Convention Center location. I’m looking forward to it.